Transportation, which runs almost entirely on petroleum fuels, and electricity generation, which had used mainly coal, have long been the largest sources of CO2 emissions in the United States. Although power plant smokestacks exceeded motor vehicle tailpipes and other mobile sources such as aircraft in terms of CO2 emissions for nearly forty years, this year brings a crossover of these two emission trends. Last year, U.S. electric sector emissions hit a new low. 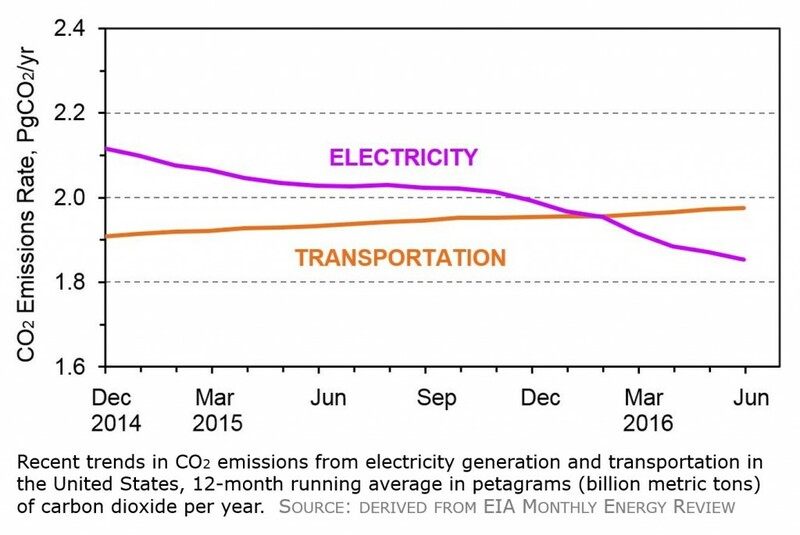 For seven of the past eight months, the CO2 emitted by the transportation sector has been greater than that from the power sector. These most recent data confirm the trend noted earlier this year by Sam Ori in a Vox article by Brad Plummer, and so 2016 is on track to see mobility overtake electricity as the country’s biggest contributor to global warming. The two sectors’ emission levels were essentially tied in the late 1970s. Then the back-to-back insults of the 1973 Saudi-led oil embargo and the 1979 Iranian revolution triggered price and policy changes that that fostered a 68% increase in average new car and light truck on-road fuel economy by 1987. That efficiency gain curtailed transportation fuel demand and CO2 emissions for the next two decades. Meanwhile, electricity use continued to grow and until recently relied mainly on coal as its source of energy. Since reaching a peak in 2007, electric sector emissions have fallen at an average annual rate of 2.8 percent through last year. Although the recession dampened power demand, the big story was the rejuvenation of domestic natural gas production due to fracking. Combined with progress in wind and solar power and ongoing energy efficiency gains, the result was a 20% drop in U.S. electric sector CO2 emissions over the past eight years, from 2.5 billion metric tons per year in 2007 to 2.0 billion tons per year in 2015. CO2 emissions from transportation also fell during the recession. Moreover, auto efficiency was by then rising again due to higher pump prices and stronger Corporate Average Fuel Economy (CAFE) standards soon amplified by new motor vehicle greenhouse gas (GHG) emissions standards. However, the decline in transportation sector CO2 emissions was short lived. Starting in 2012, economic recovery and a moderation of motor fuel prices have turned the sector’s CO2 emissions upward. The rate at which carbon is emitted from mobile sources rose at an average rate of 1.8 percent per year over the past four years. Calendar year 2015 saw transportation and electricity generation in a statistical tie as sources of CO2. Monthly data from the Energy Information Administration (EIA) indicate that, averaged over the year, transportation will top power production in 2016. The adjoining chart shows the most recent trends as a 12-month running average, placing the crossover in February. A closer look at the data is provided in the Technical Brief cited below. Electricity demand is highly seasonal, with a pronounced summer air conditioning peak and a smaller peak during the winter heating season. EIA reports monthly energy data with a three-month lag, so we don’t yet know whether this summer’s peak power production resulted in CO2 emission levels greater than those from what is typically a much more modest peak in travel during the summer months. Nevertheless, the recent trends, as well as projections from EIA’s Annual Energy Outlook, show that we’ve now entered a period where the transportation will be the nation’s largest source of CO2 emissions. That will be certainly be the case as the Clean Power Plan (CPP) plays out. Prior to the CPP, motor vehicle GHG emissions regulations were the country’s most effective carbon control measure. These standards, which limit tailpipe emissions from personal vehicles as well as freight trucks, will keep transportation emissions from growing rapidly. But they won’t put the sector on a steadily declining trend in the way the CPP will progressively trim GHG emissions from power plants. Even though the CPP faces a court challenge, both utility companies and states are moving forward to steadily cut carbon from that sector. This development highlights a question with which transportation energy researchers been grappling. Beyond motor vehicle standards — the only policy demonstrably effective to date for curtailing transportation CO2 emissions at a national scale — what else should be done to mitigate the sector’s contribution to climate disruption? DeCicco, J.M., Transportation is Overtaking Electricity Generation as the Largest Source of U.S. CO2 Emissions [PDF]. Technical Brief. Ann Arbor: University of Michigan Energy Institute, 15 September 2016. From the developed economies these countries have had declining carbon dioxide emissions in the past 10 years. These economies share some common themes that can show Australia, and the world, a viable path to reducing emissions. 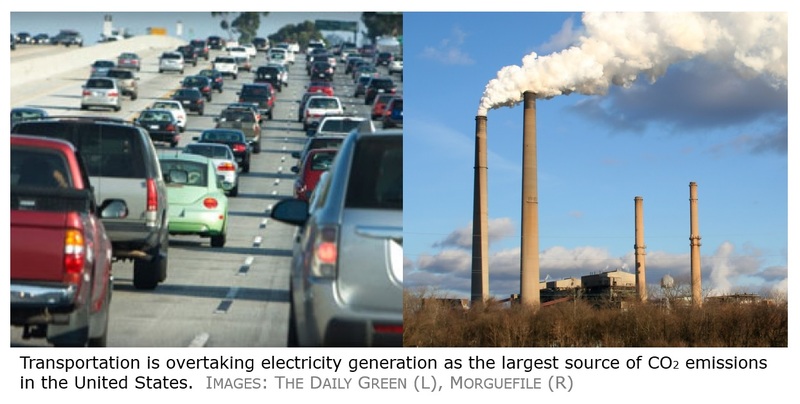 Global CO₂..
U.S. net electricity generation increased by 4% in 2018, reaching a record high of 4,178 million megawatthours (MWh), according to EIA’s Electric Power Monthly. Last year was the first time total utility-scale generation surpassed the..